In the third quarter, the second unit played well and really got rolling. Meanwhile, the Knicks missed their first 13 shots of the second half and were outscored 31-14 in the third as the Rockets opened up 20+ point leads. Houston’s defense got back to what they’re known for, playing great defense and allowing their fewest points in a second half this season (31). That was essentially the ballgame, and the Rockets cruised from there. If they had only done that in Oklahoma City. All of this happened with no Tracy McGrady (just like the victory against Boston) or Ron Artest (more on that later) playing a minute. But Shane Battier did return after a 5-game break. Although he would only score 9 points on 3-of-10 shooting, I believe his presence in the lineup makes a big difference. Fortunately for Yao, who looked tired Friday night and in the second quarter Saturday, got lots of rest in the second half as the game became a blowout and his teammates put the game away. In addition, the game ended as quickly as I’ve seen the Rockets play recently, around 9:40pm after a 7:30pm start. So everyone got to go home 20 minutes early. Taking a look at the boxscore, it’s impressive. The Rockets outrebounded the Knicks 60-38. I think that’s one of the biggest margins I’ve seen in years. The Rockets also only committed 9 personal fouls and had 10 turnovers – probably a big reason why the game ended so early. And the scoring was balanced as I believe it should be every night (McGrady needing to score 26 like he did Friday night is not mandatory for the Rockets to win). Scola led all Houston scorers with 18 points, Rafer Alston had 17, Von Wafer continued his torrid shooting (50%) to score 15, Yao had 14 on 7-of-8 shooting, and Aaron Brooks had 16. Now the Rockets have 3 days off until they play the Lakers in Houston Tuesday night. Unfortunately, Artest will not be playing that game because he underwent a bone scan Saturday and it showed an “area of stress” (not necessarily a fracture) in the right ankle. Further testing will be done to determine his availability, but they know he won’t be playing Tuesday. 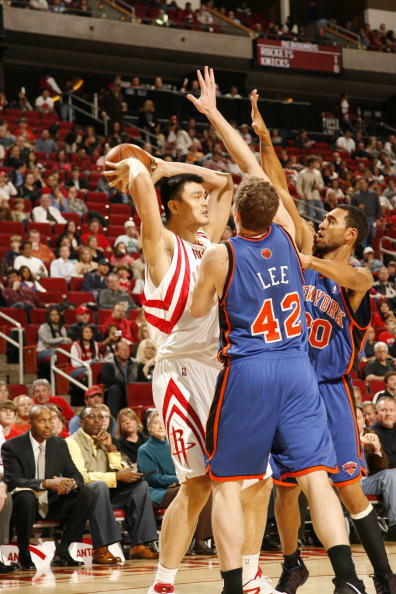 If there is one player the Rockets cannot afford to lose other than Yao, it’s Artest. This entry was posted on Sunday, January 11th, 2009 at 1:33 am	and is filed under vs. New York. You can follow any responses to this entry through the RSS 2.0 feed.